As always, I am excited to be back to present a new post on our regional history! As I wish to keep concerned folks informed and enlightened, if this desired effect is accomplished, my efforts are well rewarded. As many of these posts appear sometimes weeks apart, I also hope that, perhaps, the interest of the content helps to make up for less frequent postings. Remember, as I go about presenting research on "Fayette/Westmoreland Forgotten History" at "www.histbuffer.com", the main idea is to provide detailed aspects of regional importance, and is of course, not meant to replace other avenues of understanding but to supplement those facts and observations more well known and to further round them out for those interested in these fascinating topics. Here we will be mainly examining the presumable site of Captain Jacobs' Westmoreland County hunting cabin, additionally giving consideration to the stream and the swamp of the same name. What evidence exists in this location and particular vicinity will hopefully be fully postulated with a brief aside that his descendants may have been carrying a part of his Indian heritage into the future. 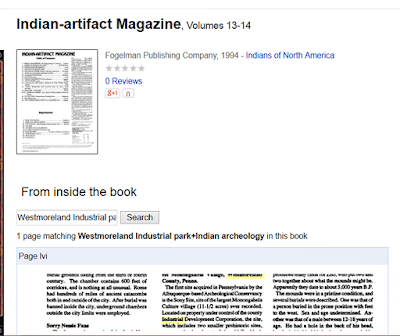 On the first post, the traditional history of the Indian Chief was dealt with to a fair extent. The reality of his fort, important aspects of his known life, and his death at Kittanning were documented. In the past it has been said there was a belief that this Indian of note was sometimes thought of as more of a peaceful person; fishing, hunting and whatnot in southwestern Pennsylvania. He may of only wintered here for an unspecified amount of time.Then again, the site might of experienced his coming and going, possibly for years in these more southerly lands. With the strife caused by various factors of the French and Indian War, we should be keenly aware those of the like of King Shingas, a close compatriot of Captain Jacobs, became a real and abiding terror to the colonial inhabitants and settlers to Pennsylvania, as well as other such dynamic Indian leaders; certainly by the usually more warlike Shawnee. An atmosphere of growing resentment, preyed upon the Indians feeling the slights of encroachment to the west of the Susquehanna River. The same could be said to have been the eventual disposition of some of the white colonists of Pennsylvania and Virginia also. Neither were normally so quickly disposed to violence against their neighbors. In fact, here we are dealing with the earlier whereabouts of a Delaware Chief believed by most historians to of once been active at the Westmoreland and Fayette County eastern border region well before the trying days where different segments of the Indian forces, the colonists and settlers experienced varying reactions to the oncoming presence of the French, major uprising, deeper territorial worries, and finally, bloodshed. The additional analysis in Part Two is necessarily based on circumstantial evidence and is almost on the order of a detective work, so to speak. I would suggest at the outset, this study was a worthy endeavor. The decision to include a 'Note' section toward the beginning of the post and not at the end was haphazard, but I felt it was the best way. I am partly indebted to the author of "In Search Of The Turkey Foot Road", Lannie Dietle for aspects of his exacting search for material on Captain Jacobs and copies of the early surveys, and a nod to the research of Norman Baker for some information on the Braddock Road and localization of coordinates. There are a handful of newspaper articles included for your perusal in fair use practice for historical research purposes, particularly by courtesy of The Pittsburgh Post Gazette and The Tribune Review. By the way, I feel the need to express a statement which is being made before research is initially presented for your valuable attention. While the attempt to properly divide the contents into subheadings is clearly a main objective in formatting, if this is not always followed perfectly to the letter or delineated in an exacting manner, do please excuse any minor indiscretions and occasional grammatical inconsistencies, concentrating more on the basic structure and meaning of the article as a whole encompassing the major issues contained therein. A subheading on old legends and myths finished up the first post, although the latter was not in any way a complete comprehensive study. These will be briefly noted only if the arises, so as not to overly enlarge such an already comprehensive article. The same sentiment goes for both posts toward the sparse references to Jacob's possible descendants that were provided to give an idea of this line of speculation and to the quantity of surveys and maps. Please do check out anything missing here that is available in the confines of Part One. 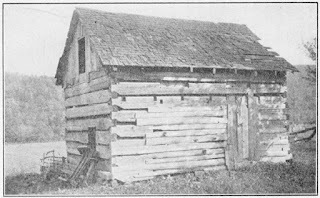 The location of this hunting cabin and its usage by a man named Jacobs, (after its probable abandoning before being settled by colonists), doesn't correspond to the Captain's later whereabouts at the time of the French and Indian War and before his death. That the army of Braddock did in fact rest at the place marked with his name is well substantiated. 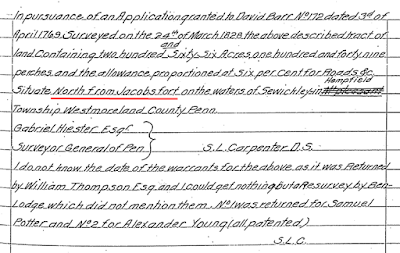 Allusions such as, Jacobs was at Sidling Hill in 1756 and burned Fort Granville; this is termed common knowledge. 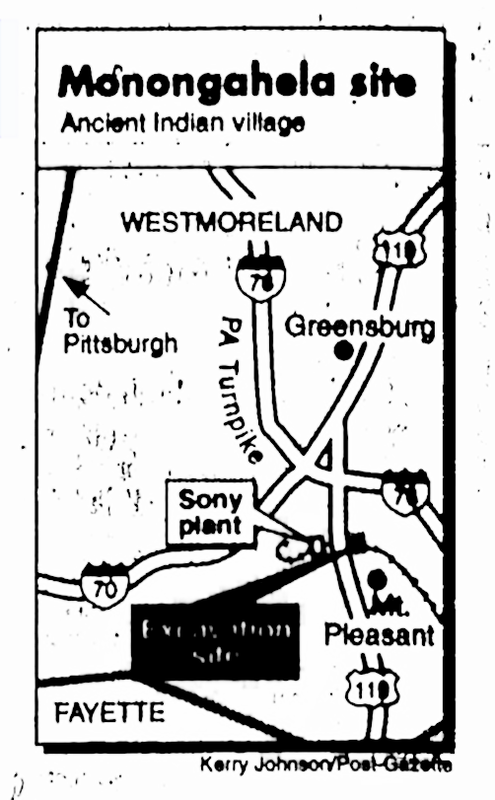 As for his other relatives or descendants, these may, or may not, of had any connection to Westmoreland or Fayette County. It is related that 'Tewea' was given the name because, (instead of being mistaken for), he resembled a burly German from Cumberland County of that name. So it is claimed. Jacobs was said to be a head chief, and a Delaware. Much more can be sought out to prove his credentials. Gist's journal notes when returning south from John Frazer's near Pittsburgh at Logstown, that at night they "encamped at Jacobs Cabins"
Northwest of Mt. Pleasant at Jacob's Cabins is delineated as the 15th Camp of Braddock between the bivouac at the Great Swamp of Hammondville, after the Stewart Crossing which is the 14th camp, and next, the 16th Sewickley 'Salt Lick' Camp near Hunker in early July of 1755. According to the book: "Braddock's Road, Mapping the British Expedition" etc., by author Norman L. Baker, which partly coincides to some degree with this research, it is thought the Braddock Road was following a part of the old Catawba Path, the main branch of which headed northeastward from the Stewart Crossing area and ran along Mounts Creek to Laurelville and then crossed the Glade Path, running east-west on its way to Mt. Pleasant. While Braddock partly followed a minor path near the border of Upper Tyrone and Bullskin townships through South Everson north to Walnut Hill, the army then proceeding past Prittstown and to Hammondville toward the north and east and turning directly north through Mt. Pleasant to Sand Hill to the location of what is the old Sony Plant today, the RIDC complex where, coincidentally, I use to work through much of the new millennium. Then proceeding on toward Hunker and beyond. The point here should be that Baker claims the Orderly Book incorrectly called it "Camp Near Jacob's Cabbin." It is unknown if there is a possibility of a Jacobs site anywhere near Hammondville in Bullskin Township, but appearances are on the doubtful side. 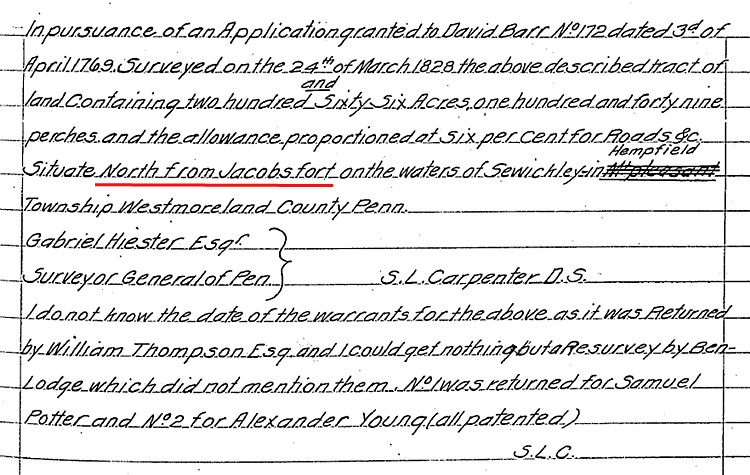 Baker also stated, "Laycock also incorrectly located the camp near Jacob's Cabins" You'll notice that is with an intriguing 's' added on to 'cabins' has a specific reasoning. This element will be related in a description below, and may have further import of its own in considering a larger village with a hint of fortifications. I hope to corroborate these conclusions and elaborate in an attempt to achieve an expanded sense of accuracy. On old maps can be found the placement of the bivouac near the Truxel farm near Hammondville, yet observed is a marking for a campsite to the north at the crossing of Jacob's Creek before the route turned further north to Mt. Pleasant and up the Braddock's Road and on to Sand Hill and the West Tech Industrial park. Little to nothing is actually known of the naming of Jacobs Creek, the dividing line between the counties of Fayette and Westmoreland. "This stream in Governor Pownell's map of the colonies, 1776, is called Salt-Lick Creek. This Capt. Jacobs is the same gentleman whose name was such a dreadful one to the frontier settlers after Braddock's defeat, who headed more than one marauding excursion, and who figured in the capture of Kittanning by Col. Armstrong in 1756." This example of an historian's traditional observation allows for a definitive connection to that same Captain Jacobs known by clear and proven underpinnings farther to the north. Yet these old texts hold a mysterious quality in their lack of origination beyond the historian's biases and ideas. At times, this can be a serious weakness to the modern researcher looking for the truthful kernel of a matter while dealing with the possibility of mistakes and exaggerations; the minor puzzles from antiquated history books. Jacobs, Indian or no, probably did indeed keep a hunting camp in this stretch of land around the creek very likely named after him, and quite possibly, using one or more minor locations as other stopping places.Traces of tradition as attached to such places as the Jacobs Creek headwaters, Freeman Falls in the village of Jacobs Creek, near the Everson Bottoms and in the Owensdale area. All have in common the distinction of comparing favorably with the known location of Jacobs Cabins, especially as in a moment, more evidence of ancient Indian occupation will be presented. 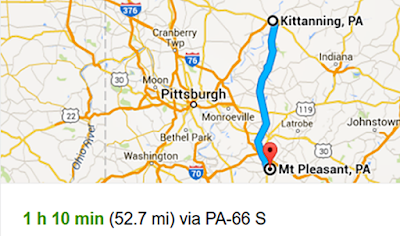 According to "The Statutes at Large of Pennsylvania from 1682-1801, Vol. 9", we read of, in what appears to be a Virginia Convention of 1776, referring to the basic route of Braddock's Road "...Along the said road to the great crossing of Youghagany; thence down the meadows of that river to the Chestnut Ridge; thence along that ridge to the easterly branch of Jacobs creek; otherwise called Greenlick-run; thence down the said run to Braddock's Old Road" The subject of Braddock's Road that concerns us here will be dealt with soon. According to G. D. Albert's "History Of Westmoreland County" page 436, "Jacob's Creek, in Westmoreland County is called for Capt. Jacobs, a noted Indian Chief who had his lodges and papoosses betimes near it." 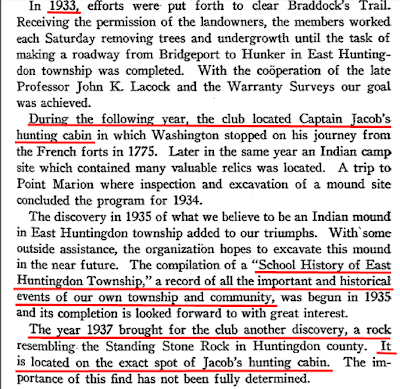 He goes on to further state, "Jacobs Swamp was the designation of a large body of land in East Huntingdon township, about Ruffsdale, and is the same by which a portion of the land was patented". Which is very enlightening considering the designations further to the north west to Jacobs Swamp and likewise to the south nearer to the actual location of Jacobs Creek within better known historical times. It might be worth mentioning too, that few early tracts of land connected with white settlers seem to involve swampland, at least until a later time. To my way of thinking, this almost concludes the matter, excepting that these firm stances might be conducive in helping to explain something easily taken for granted. The enduring local traditions about this particular stream had surely been heard of by such scholarly men over the years and they responded in kind. In other words, a whole lot of smoke without a fire. The oldest references to Jacobs Cabin should clearly hold some good weight. A question that pertains to whether Jacobs, or 'Tewea' as was said to be his Indian name, was near there after the Braddock Road was broadened by Washington and Braddock in 1755, of course his whereabouts in later life hardly would of included his cabin site. C. H. Sipe, in "Indian Wars of Pennsylvania" notes that he was supposedly given the name by Arthur Buchanan at Lewistown where Jacobs once resided, to whom he sold some property. This was said to be because, (instead of being mistaken for), "of his close resemblance to a burly German from Cumberland County." He was said to be a head chief and in fact, a Delaware. The fact that there was more than one Captain Jacobs is not in question. Whether there was another descendant or relative so-called during our Captain Jacobs' lifetime is another matter entirely. Significantly, I know of no proof of the relation of any other person by that name until after his death, but it was claimed by a witness that a cousin of his was killed along with him also called sfter the Captain. . Nevertheless there is the curious report of Peter Tittel from 1760 who claimed he talked to an Indian by the name of Doctor John who said "they killed Capt. Jacobs, but he had known another Captain Jacobs, a young, big man, bigger and stronger than him, that was killed." The record appears to state that later Tittle, or Title, changed his story that this Jacobs was not killed. Could this possibly be relating to the nephew, claimed to be seven feet tall ? Or maybe even a murky tale of the 'burly Dutchman' ? It might be difficult to put much stock in such a second or third hand report, except this was taken in a sworn deposition. A Captain Jacobs was also said to be at an Indian conference at Ligonier with Joseph Brant in the same year of 1768. Such provided above should suffice. Whether there is any truth to the idea of the well known turn of the nineteenth to twentieth century historian, John Kennedy Laycock, that there may well of been two Jacobs cabin locations, although it appears unlikely, in my estimation, this is simply unknown. .Captain Orme relates in his journal that "On the first of July, we marched about five miles, but could advance no further by reason of a great swamp which required much work to make it passable", while Gordon wrote of "Main Crossing to Terrapin Creek-Five Miles", this is his estimation, fittingly, Terrapin being Greenlick Run. To offer only one proof toward the Stewart Crossing being the most accurate,as it is a well known fact that this would require an ascent up the steep hill to get to the Narrows, for the same day as above, the British A Hardwicke version has the report- "July 1st, March'd early over a very long & high Ridge..." A second example is contained in the June 30 journal of Orme, where he referred to crossing the 'Yoxhio Geni': "We were obliged to camp about a mile on the west side, where we halted a day to cut a passage over a mountain..."
Now on July 1st, Halkett's orders references the 'CAMP AT JACOBS CABINS'. And the British A Hardwick version clearly states, "The 2nd Marched about three and reached 6 miles to a place called Jacob's Cabbin; course North." For the date of July 3rd, Orme's journal relates, "The swamp being repaired marched six miles to Salt Lick Creek." The plausible conclusion can be understood for this to mean the Jacobs Swamp, not the previous day's 'Great Swamp'. This must be reckoned with. Furthermore, the information coincides correctly with the same order of encampments as listed in "The Gentleman's and London Magazine" from the December 1758 issue. The above note of the camp sites points out the antique usage as well as the true order of the traveling to the Jacobs Cabin region. Please note, this clearly shows the Great Swamp of Bullskin Township as the former camp site of Braddock's Army, listing Jacob's Cabin as No. 15. The proof is apparent in this traditional listing and agrees with other research. As reported by Norman Baker on page 128 of his book, "One survey referred to a tract of land immediately north of Braddock's Road and Jacob's Cabins as 'North from Jacobs Fort'." 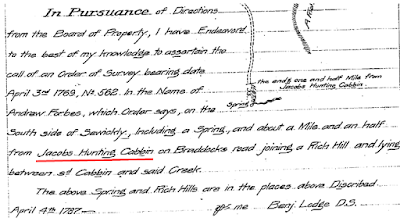 No definitive authentication for Captain Jacobs in Westmoreland County has been so far located, yet the circumstantial evidence all appears to point to Captain Jacobs as the derivative person named by 'Jacobs Swamp', 'Jacobs Creek' and 'Jacobs Cabin'. It is reasonable to suggest that this was indeed the case as one particular point is obvious: there were few white men in this region in the mid-1700s and again, the tradition that all these were named after our Captain, Chief Jacobs is the most sensible theory. We have the Jacobs name on the cabin and the swamp, yes. We have the name Jacobs Creek, which would plausibly connect the stream and the Indian Chief of tradition. Presumably, this is his hunting ground, although no known document explains this. In 'History Of An Expedition', Sargent writes, that George Washington and Christopher Gist camped at Jacob's Cabins before and after the trip to Le Boeuf on Nov. 19, 1753 and on Jan. 1, 1754, (courtesy of Baker's book.) However, there is another remote possibility besides the obvious one that they confused the two camps, that would involve the conclusion there was a cabin or a landmark of some kind in the area of "The Great Swamp' at Greenlick Run that helped create the confusion and led to the misleading improbable identification in the first place.This would partly lead to some explanation as to a curiosity, noticeably why the Cabins are marked with an X to the east of Jacob's Creek near Greenlick Run at specific places on some old maps. We can speculate this could allow for some reprieve to the assumption that Laycock was just blowing steam in his claim of two Jacob's Cabin site. There is also said by a another researcher to of once existed a Jacob's base in the Everson area to contend with. The documentation for any such proof is either lacking, or I am just not privy to it as of yet. 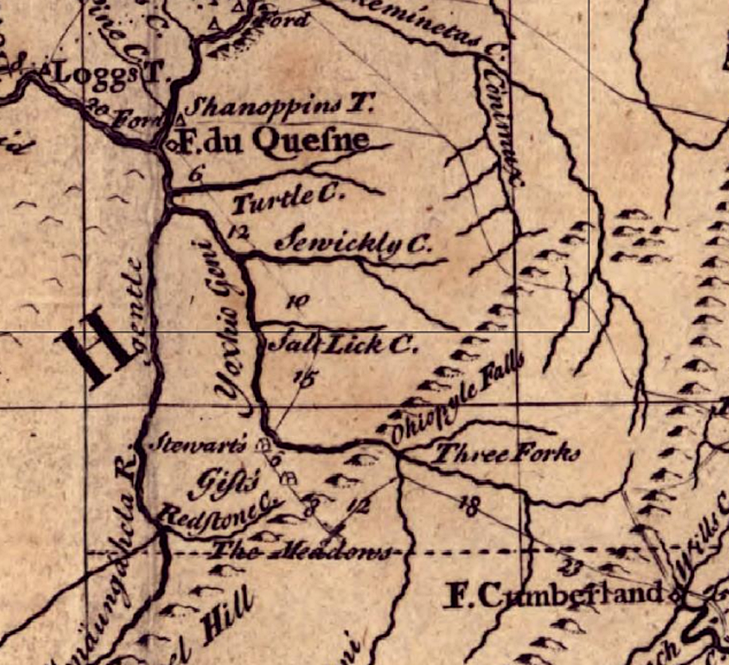 One alternative explanation causing Laycock's seeming confusion could be the Braddock crossing of Jacob's Swamp and the previous Jacobs Creek crossing at the 'Great Swamp' was itself enough to cause the misnomer. You can take your pick, though more evidence points to a mileage mistake as another instigating culprit. It made matters more muddled that the distance from the 12th camp, the Narrow's or 'Main Passage' 13th encampment to the next after this to the northwest of Mt. Pleasant at Sand Hill Road,by what is now, a R x R crossing in the West Tech Industrial Park, the traditionally accepted place; this is, and was, variously given as 5, 7 and even 8 or 9 miles. Here , the army also has to ford a fairly large swamp near a 'walnut grove.' The likely mistake appears to be from Stewart's below the Yough River to either the bivouac on Jacobs Creek, or to the Cabin site being misinterpreted. Regardless, the distance reported as approximately five miles between Camp 14 and 15 does seem to make a estimate and fits the situation well. According to a report of the Mt. Pleasant Historical Society, "It seems highly likely that there was more than one than one Jacob's Cabin in our area. 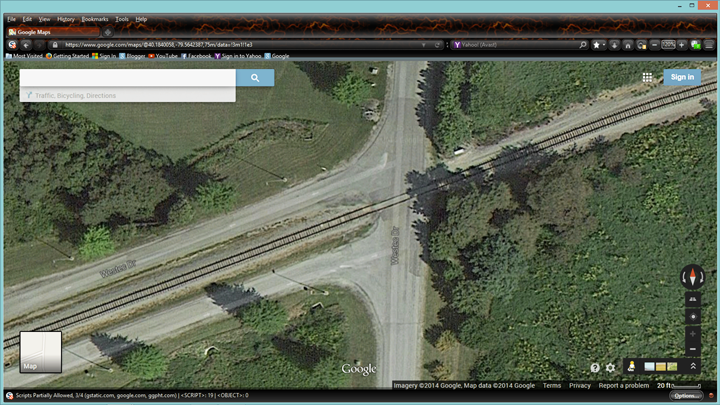 In a new study evidence suggests that Jacob's Cabin is a little beyond this location and within the Industrial Park." 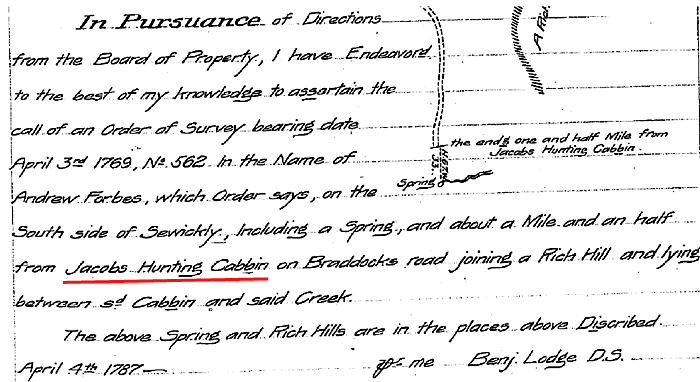 This is more probably a reference to considerations that the Jacobs Cabin site might be more to the southeast near Sand Hill than north at West Tech Drive where it is generally believed to be nowadays. This is a harmonious conclusion in agreement with Mr. Dietle's research, that of Mr. Baker and in collusion with the material of the article you are now reading. Although more so in the vein of an inconclusive supposition, I would add, a part of old Route 119 might of been a part of the old Glades Road to an extent and on branching past Mt. Pleasant to New Stanton made a heading for West Newton. Just food for thought. Little is known of the naming of Jacobs Creek, the dividing line between much Westmoreland and Fayette counties. An early document of a land grant from the Pennsylvania Supreme Court files concerns an ejectment in Mt. Pleasant township, some details which hardly concern us here, "...on an application entered in the land office 3d April 1769, No. 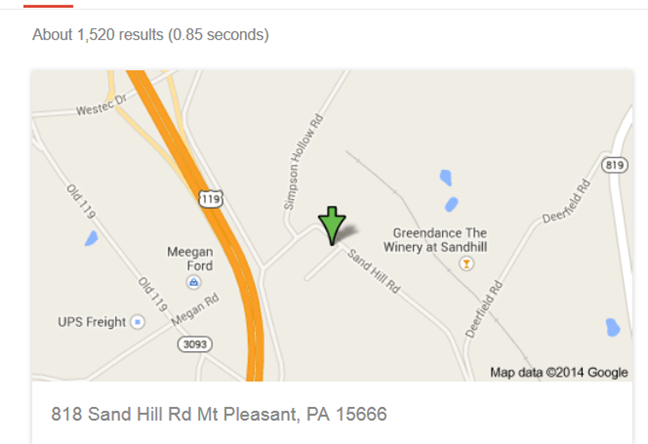 554, for 300 acres of land, adjoining a small branch of Sewickley, on Braddock's Road, the south side of Jacob's Swamp." reading further down, we have, "...a location dated 9th Aug, 1769, No. 3722, for 300 acres on the waters of Jacob's Creek and Sewickley..." This helps to more precisely narrow down the vicinity we are dealing with and verify the antique age of the name of Jacobs nearby. 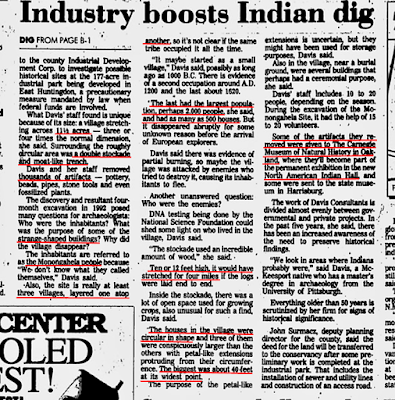 As Lee Linder, Associated Press writer once put it on July 8, 1970, " ...Jacob's Creek is named after an Indian chief." The subject cannot be summed up more simply and directly! To be more precise, James Veech, in his "Monongahela of Old" does not specifically claim he holds evidence this Indian was Captain Jacobs, "Jacob's cabin was doubtless the abode of an Indian, who gave his name to the creek on which he trapped and hunted". As intriguing as this reference may be, the reasoning behind his knowledge is conjectural. Presumably, by the wording he chose this does imply the statement is meant to be taken rather emphatically. In fact, a 'TRIPLE THREAT' type of circumstance' is involved. Thirdly, an ancient Indian cultural site of a fairly large extent of rare swampland magnifies the importance of the surroundings. Finally, the famous Reverend Powers most often connected to the United Brethren church, preached at Jacobs Swamp as early as 1772 and certainly 1774. In 1776 he established the Middle Presbyterian church on Rt. 981 near Mt. Pleasant. The Rev. David McClure was said to of preached near Jacobs Swamp eighteen years later. 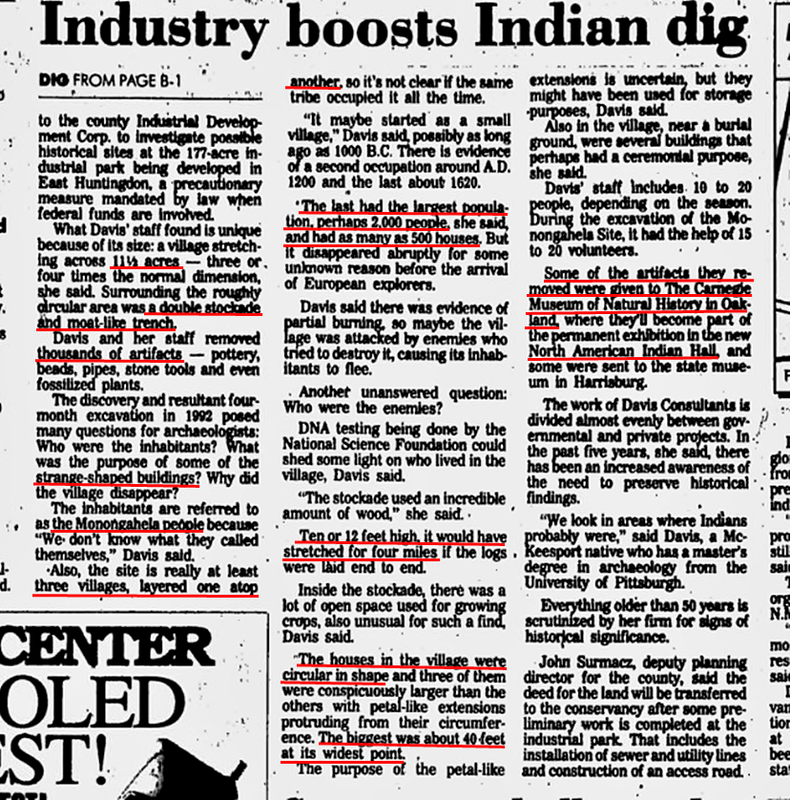 Now to inform those that are unaware of the largest Monongahela Culture site in the northeast, and possibly in the country, an extremely important factor in reckoning the reality of the Indian origin of Jacobs Cabin is proven below. I had no luck trying to obtain any of these rare pamphlets, etc. 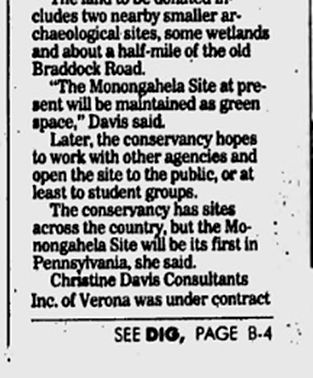 An email inquiry addressed to Christine Davis Consultants was made requesting any conceivable further pertinent information on a conservancy update in the last 25 years, and about observations on this site concerning the extensive archeological dig that took place place here, or any other statements in general that they might wish to make to explain their views, but I have, as yet, not heard back from the company. This particular Monongahela village was considered by experts to be one of the largest. Although this was considered an ideal site for a conservancy, the suspicion this has been derailed, an unfortunate occurrence, may stem from the influence of nearby industrial concerns and is only kept as a 'green space' as the situation is understood. The GPS coordinates for this vicinity are latitude 40.184001, longitude -79.563861. 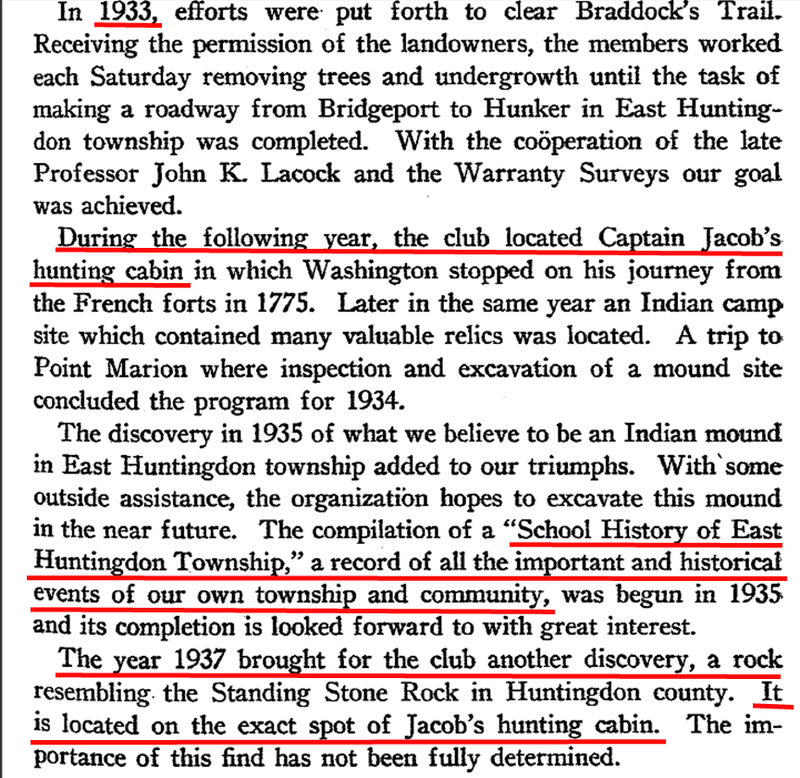 Realizing that the Jacobs Cabin/Fort location was in the middle of the largest known Monongahela Culture in the northeast; which is an established fact, leads to deeper implications and inferences. One can imagine thoughts of other possible connections in this unique realm. The information contained in this article is a great loss since there doesn't seem to be anyone with knowledge of this story around today. I would love to know more of the 1930's finding of Jacobs Cabin, the curious Rock and the details of these relics of the Indian camp. There are certainly many avenues leading to the appearance of a veritable tradition of research helping to tentatively conclude that Captain Jacobs, or possibly a chiefly descendant of this Indian was actually in the suurounding region. 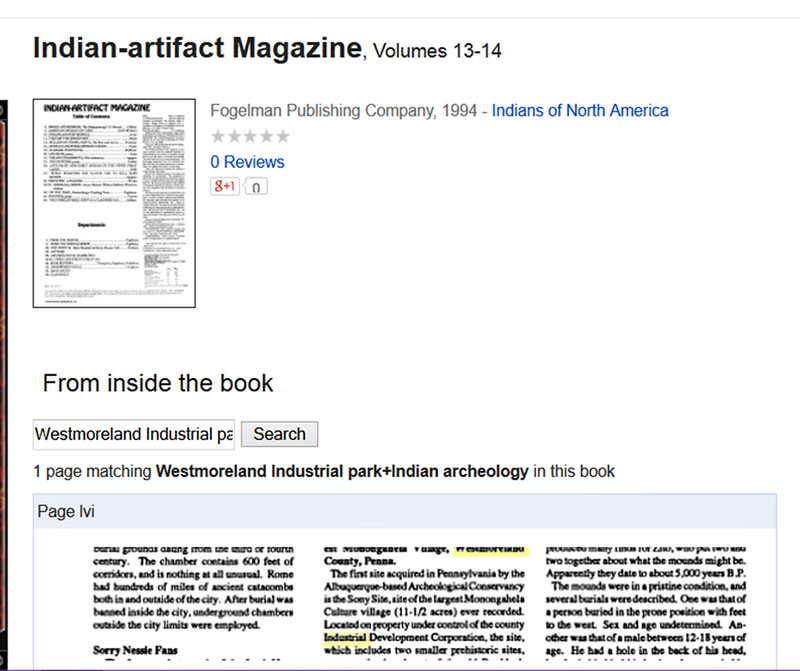 And specifically on the borders of Hempfield and Mount Pleasant townships where, incidentally, there was, in fact, what is termed for lack of a better and more clarifying term, an ancient Monongahela Cultural site to bolster the Indian presence of the location in question. The oldest references to Jacobs Cabin clearly hold weight in an historical sense. One question I was frequently asking myself pertained to whether Jacobs, or 'Tewea' (said to be Captain Jacobs' Indian name) had in some capacity lived for an unspecified amount of time in the East Huntingdon and Hempfield region of Westmoreland County. Evidence derives from Christopher Gist's journal; also from applications for land surveys not too long after the era when the Braddock Road was blazed by Washington in 1754 and broadened into a true roadway by General Braddock in 1755. The answer to whether this cabin and swamp were actually settled and named for Captain Jacobs, the Delaware Indian of note, while not distinctively verifiable in the affirmative, common sense would strongly hint that surely he, or a relative of his, was not in this region afterwards, but probably beforehand. 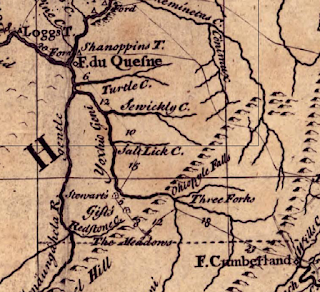 All in all, honing in on the various aspects of the case, along with the traditions and minor legends, there is a strong likelihood the presence of Captain Jacobs was a reality in this interesting region before the years of 1754 and 1755. I believe this is a reasonable supposition and could fairly conclude this is the scenario to best fit the facts so far accumulated on the subject. If by any chance anyone has valuable information available, please email or message me, or leave a comment on the blog. This would be most appreciated. I have learned so much, and this is exactly the history I've been searching for! Thank you!!! First of all, you are quite welcome, Karen! I'm pleased to see your enthusiastic response. I have attempted to hone it down to the original substance of the subject. If this is recognized as a meaningful additional supplement of research toward this branch of history, then I feel the accomplishment is worth it. I set out to get the facts and specific vicinity gathered together for that purpose, for as you seem to be suggesting, it can indeed be difficult to locate this information. Thank you for commenting on the post.